I love it! Well I really love Kevin but that is a GREAT idea! :) Thanks Laura. I love this idea! It’s so awesome. Such a simple thing and yet it says so much. I love your idea! I think I’ll try that! Something I do: my husband and I are both pretty quiet and not really big on public-displays-of-affection, mainly because we don’t get out alot together. Anyway, I like to write little “love letters” on his Facebook page. I am careful not to write anything that would be embarassing to him, me or our children, but something like “I’ve missed you today”, “Thanks for being such a great husband” or “Let’s plan a date night soon”. I did the same thing! It is such a great reminder of how much I love my husband. It’s also helpful in remembering the password more easily. I feel giddy right now, because husband and I have been married for a little over 4 years, I have been taking birth control for 3 months, and before that I had a birth control “implant” in my arm. Well, despite this, last night I found out that I am pregnant. Its quite the shocker because I didn’t think we were having any more kids… Like, at all. But surprise!!! Here’s another. Lol. You’re right…life gets sooo busy! Such a great and cute idea, so simple yet so meaningful too! LOVE your marriage advice. Would love to read more too! So, if your husband needs your password, he gets to type in “I love Matt” (or whatever) and that probably makes him feel a bit foolish (in a giddy sort of way!) You two love birds…… Thanks for sharing your little secrets. My husband and I have been married 18 years and our “at home” terms of indearments make our offspring gag. We must be doing something right! They at least know their parents love each other, and that is the best thing you can do for your kids. What a great idea! I like to use special (known only to me) Scripture references as passwords. And then I change them from time to time when new verses or passages or Bible stories take on some deep meaning for me. Thanks! This has perfect timing, I need to change one of my passwords now. My husband has been using a similar password ever since we started dating 6 years ago . . .lol . . . Maybe that’s because we were in high school when we started dating. :) It makes me feel very loved every time I see him entering it and I hope he never changes it! I do the same thing! Great minds think alike, I guess. YOur idea is wonderful Laura. When we marry we say those words “for better for worse, in sickness and in health” with such stars in our eyes and have no idea what that really means. My husband of 33 years has now lost his ability to make a living, to serve others and to be the head of his home and it breaks my heart. Ladies, love your husbands with a passion that honors the LORD no matter what! 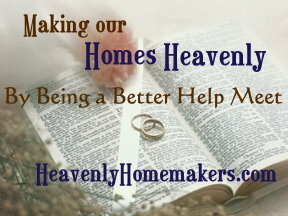 I am blessed to serve my precious husband even though he cant be the husband he wants to be anymore. Time is precious and it can be taken away in a second so live a life that causes you to have no regrets. Love your blog Laura, thank you. Very Cute idea. I have also used a loving phrase as a message to my real man. You know the scrolling screen savers? Write something lovey on there to your spouse. They’ll love it. And probably roll their eyes… but they still love it. At church the other day we were discussing creating something special that would remind us of our husbands, thus reminding us to pray for him. I don’t think we realize how much prayer our husbands need. Sometimes we’re the only one praying for him, and God has set them in such an important place in the family to bear so much on those broad shoulders. What would we do without our guys? I have been enjoying your ‘Help Meet’ series and, of all of your posts, this is far and away my favorite. I completely relate to those early, giddy days of effervescent affection. It is a beautiful idea to set a password to remind myself of the one I love and those early feelings, thanks for sharing! I look forward to your future posts and suggestions. We love groupon! I got my hubby helicopter lessons for 50% off!!! and we also got some sailing lessons for about 75% off!! !